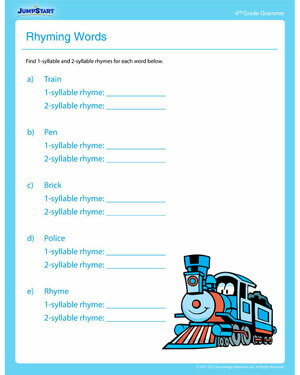 JumpStart’s ‘Rhyming Words’ is a free printable English worksheet for 4th grade . In this worksheet, 4th graders have to find 1-syllable and 2-syllable rhymes for each of the words given below. By urging fourth graders to pay attention to syllables along with rhymes, this rhyme worksheet helps them polish their language arts skills. If you were looking for more 4th grade worksheets on different subjects you came to the right place!